I have basically spent these last few days at the barn which means that I have had more time to chat with my equestrian friends (best kind of humans, they always understand you haha). The day after you use it, cleaning the horse will be easier. I started by doing a full body rinse in order to get off dirt and sweat. After that, I put some water and Betadine on a bucket and mixed it until it got full of foam. Then I lathered Galileu up with a sponge until his body was full of foam. I let it sit for a minute or two and rinsed with clean water. The results were amazing, after the bath his coat was gorgeous and so soft! Yesterday I didn't manage to take a photo of him but I will do it today and I will share it on Instagram (@equestriantrendblog). So glad you've found a handy tip for your gorgeous grey guy. 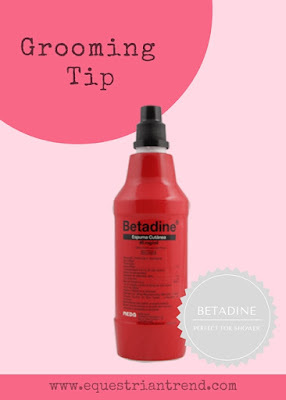 I've never heard of Betaine used as a substitute for shampoo, but have often used it on cuts or to wash away skin grogginess from sweating on the field for a few days etc. Wow! Great tip. I will try that.